Are you looking for a Melbourne Fun Run or Fitness Charity event to take part in for 2016. 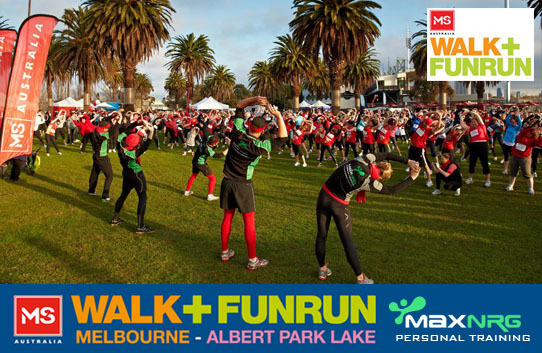 Come and join MaxNRG Personal Training and the rest of Melbourne by helping raise money for various charities and raise awareness of various illnesses and causes at a fun run, walk or ride this year! Below is a list of all the Melbourne fun runs, walks and organised bike rides that will be held throughout Melbourne, VICTORIA in 2016. Fun runs, walks and bike rides are great motivation tool for people who are looking to lose weight or improve fitness with exercise. Best of all, you can do them with family and friends to lose weight and get fit together whilst raising money for various charities and raising awareness of various illnesses and causes. *Please be sure to contact the event organisers to confirm event dates, times and places as some dates and venues do tend to change throughout the year. If you have decided to join in this years events, it is always a good idea to prepare your body for the event. When preparing for a fun run, walk or bike ride in Melbourne, VIC, there are a few things that you should do to prepare yourself to prevent injury and make the day as enjoyable as possible. It is common for people to be unsure about how to prepare for public sporting events like these especially if they have not been physically active for some time. MaxNRG Personal Training is a mobile personal trainer team that has helped many of our clients prepare for these events with individual and group exercise training programs. We promise to have you ready you for any type of fun run or charity event you wish to take part in, and guarantee to make it an enjoyable experience for all involved, no matter what your current fitness level is. Enquire about preparing for one of the 2016 Fun runs, walks and bike rides here. This calendar of events list has the majority of Melbourne Exercise Events in 2016, Melbourne Bike Rides, Victorian Fun Run and Walks and the Main 2016 Charity Walks and Melbourne Fun Runs. We are still waiting to receive race details and event updates for this month. Be sure to follow us on Facebook for all the latest Fun Run & Charity Event updates that are happening in Melbourne, VIC. If you know of any January Fun Run Melbourne Events for 2016 that have been confirmed, please send an email to Russell Laurie – info@maxnrgpt.com.au and we will be sure too add the event to the list. If you know of any February Fun Run Melbourne Events for 2016 that have been confirmed, please send an email to Russell Laurie – info@maxnrgpt.com.au and we will be sure too add the event to the list. If you know of any March Fun Run Melbourne Events for 2016 that have been confirmed, please send an email to Russell Laurie – info@maxnrgpt.com.au and we will be sure too add the event to the list. If you know of any April Fun Run Melbourne Events for 2016 that have been confirmed, please send an email to Russell Laurie – info@maxnrgpt.com.au and we will be sure too add the event to the list. If you know of any May Fun Run Melbourne Events for 2016 that have been confirmed, please send an email to Russell Laurie – info@maxnrgpt.com.au and we will be sure too add the event to the list. If you know of any June Fun Run Melbourne Events for 2016 that have been confirmed, please send an email to Russell Laurie – info@maxnrgpt.com.au and we will be sure too add the event to the list. If you know of any July Fun Run Melbourne Events for 2016 that have been confirmed, please send an email to Russell Laurie – info@maxnrgpt.com.au and we will be sure too add the event to the list. If you know of any August Fun Run Melbourne Events for 2016 that have been confirmed, please send an email to Russell Laurie – info@maxnrgpt.com.au and we will be sure too add the event to the list. If you know of any September Fun Run Melbourne Events for 2016 that have been confirmed, please send an email to Russell Laurie – info@maxnrgpt.com.au and we will be sure too add the event to the list. We are still waiting to receive any race details and event updates for this month. Be sure to follow us on Facebook for all the latest Fun Run & Charity Event updates that are happening in Melbourne, VIC. If you know of any October Fun Run Melbourne Events for 2016 that have been confirmed, please send as a quick email – info@maxnrgpt.com.au and we will be sure too add the event to the list. If you know of any November Fun Run Melbourne Events for 2016 that have been confirmed, please send as a quick email – info@maxnrgpt.com.au and we will be sure too add the event to the list. If you know of any December Fun Run Melbourne Events for 2016 that have been confirmed, please send as a quick email – info@maxnrgpt.com.au and we will be sure too add the event to the list. If you are looking to participate in a Melbourne 2016 fun run, charity walk or bike ride our team at MaxNRG Personal Training can help. Our mobile personal trainers that operate throughout Melbourne can help you make sure that your current training regime will allow you to participate in any event set out to achieve. Call 0403-741-278 or fill out our easy online form and a member of the MaxNRG Personal Training team will contact you shortly.